The Left parties today asked the Manmohan Singh government to desist from increasing the reservation quantum for Scheduled Castes (SC) in proportion to the Dalit population, contending that the move would defeat the very purpose of the affirmative action. As many as 15 passengers received serious burn and other injuries when a “powerful explosion” put an Una-bound PRTC bus into flames at the local Inter-State Bus Terminus (ISBT) at about 4 pm today. The cause of fire was yet to be ascertained. Preliminary investigations by the bomb disposal squads of the PAP, the Army and the Jalandhar police, have however, indicated that the fire and “explosion” might not have been caused by a bomb. 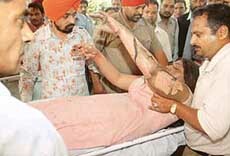 One of the victims with burn injuries at the Civil Hospital in Jalandhar on Friday. The SEBI (Security Exchange Board of India) order curtailing the market operations of major broking houses caused the Sensex to swing more than 500 points today. The Sensex opened sharply lower at 11,344 points as FIIs and mutual funds hit the panic button. The Punjab Government has decided that the Baba Farid University of Health Sciences (BFUHS), Faridkot, will again conduct the Punjab pre-medical entrance test (PMET) despite last year's fiasco. The Punjab and Haryana High Court today unseated an Independent MLA in Punjab. Declaring the election of Mr Gobind Singh Kanjhla, a former minister in the Parkash Singh Badal government, from the Sherpur Assembly constituency in Sangrur district as void, Mr Justice M.M. Kumar upheld the allegation levelled by the petitioner that the MLA had indulged in corrupt practices to clinch the election. The Supreme Court today directed the Punjab and Haryana High Court to set up a special bench to hear the petition of Kamaljit Singh in the Bibi Jagir Kaur case pertaining to alleged conspiracy to murder her own daughter. The Congress has taken a serious view of former External Affairs Minister K. Natwar Singh’s recent statements implicating the party in the Volcker controversy. However, it is unlikely to proceed against him in a hurry. The government has decided to seek approval of the Cabinet for the four-laning of the road from Attari to Wagah.